Topics addressed through country presentations and follow-up discussions were: road transport of explosives, radioactive, chemical and toxic substances as well as testing of vehicles carrying dangerous goods and most importantly - national legislations regulating issuance of permits for transportation of dangerous goods – classes 1, 6 and 7. 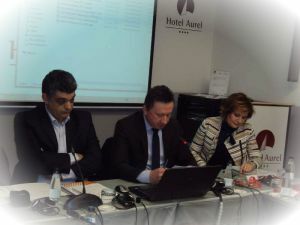 While discussing the current status of development and challenges faced in the application of related respective laws and by-laws, the participants also observed to what extent these laws had already had incorporated relevant EU directives and what was the estimation of their impact on national regulations. Necessity to establish effective information-management and data-flow between competent institutions at the national and regional level respectively was also emphasised as a pivotal point in the overall discussion. In addition to eleven (11) Montenegrin experts in the field, equal number of representatives of other five (5) DPPI SEE Parties participated in the seminar (Albania, Bosnia and Herzegovina, Bulgaria, Croatia, Macedonia and Serbia). For its whole duration the seminar was also attended by Mr. Mirsad MULIC, the Montenegrin Director General. The Head of the Secretariat joined the participants at the end of day 1 and observed the seminar until end of day 2. The seminar undoubtedly proved the importance and value of a quality expert discussion on emergency management related issues. The eligibility criteria in nominating their respective representatives was fully respected by all the participating DPPI SEE Parties.